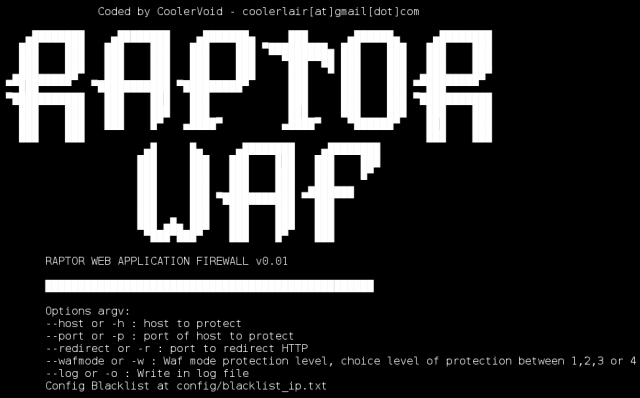 Raptor WAF is a Web Application Firewall made in C, using DFA to block SQL Injection, Cross Site Scripting (XSS) and Path Traversal. DFA stands for Deterministic Finite Automaton also known as a Deterministic Finite State Machine. It’s essentially a simple web application firewall made in C, using the KISS principle, making polls using the select() function, it’s not better than epoll() or kqueue() from *BSD but it is portable. WAF stands for Web Application Firewall. It is widely used nowadays to detect and defend against most commonly SQL Injections and XSS attacks. Do bear in mind this is an early stage almost PoC tool and not really production tested or ready, I think it’d be a great project to contribute to and most people don’t need a super complex WAF – just something REALLY reliable, stable, performant and blocks 80-90% of the common attacks.